#1.1 6 Best Gunvault Gun Safes on the Market! #1.2 Why Choose Gunvault for Your Next Gun Safe? If you own firearms, you probably want to make sure they are secure not only for your families’ safety, but also against burglary. The first step in choosing the best gun safe for your needs is deciding what size safe you would like to own. If you are a hunter who owns many rifles, you might want to consider an upright gun safe that can store many different shotguns and rifles. GunVault gun safes come in many different shapes and sizes, so no matter which type of firearm you own, GunVault probably has the best safe for you. The most important thing about GunVault safes is the safety mechanisms that are built into them. Their patented design means you won’t have to have any sort of key to get into them, as they can either be programmed with a combination of numbers which only you know, or you can set them to recognize your fingerprints, so that only you can get into the safe. The fingerprint safety model is probably the best model, as it requires your touch to get into. This type of safety mechanism is available on both the small and the large GunVault gun safes. 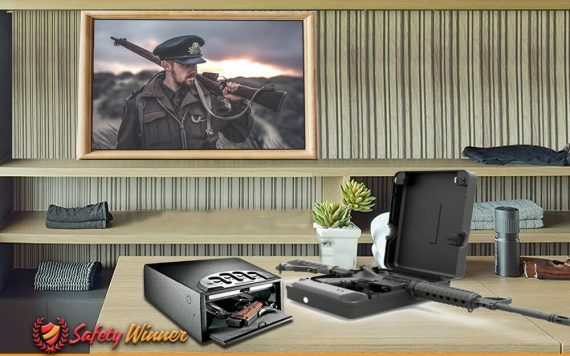 5 Best Gunvault Gun Safes on the Market! If you are looking for something spacious with a lot of extra storage at a really affordable price, this gun safe will be perfect for you. The gun safe features a multi-vault system that will allow you to store your weapon in one of the compartments and you will be able to store the other items like jewelry and ammunition in the other vault. To ensure that everything is protected from damage and impact, the interior has been lined with thick, but still comfortable foam. This will ensure that nothing gets damaged when moving the safe and that everything is still easily accessible when you open the door. The exterior has been stylishly designed and with the hinges on the inside of the door, you can be sure that the safe is virtually impossible to pry open and that all of your valuables are kept safe. Furthermore, you might not even notice the locking feature when you quickly glance at the safe and it will look and impenetrable box. The safe has also been powder coated to ensure that every part of the safe is strong and durable, while still giving that stylish look and feel to ensure that you never have to hide the safe even though it is small and portable and can easily be kept out of sight. The safe features an electronic keypad locking mechanism that is powered by a durable and longer lasting 9-volt battery. The locking mechanism is virtually impossible to crack and aside from the one handed use that it offers, you will be able to choose one of over 12 million different combinations to access the safe. The built-in computer will automatically block access to the safe after too many wrong attempts and you will need to use the backup key to open the safe. This feature is great for households with a lot of children and the safe is virtually completely childproof. With so much quality, you can be sure that no one will ever enter the safe unauthorized and that you will have total control over who can enter the safe. The no eyes keypad will make the safe great for quick access and you can easily get to your firearm in the time of need. All of the mounting hardware has also been included in the package and the safe can easily be mounted nearly anywhere in the house. You might only need to use a few standard tools and have some common knowledge regarding these tools, but we believe that the safe will be a great fit for the home. We highly recommend the safe for people with multiple handguns or with extra ammunition. The interior foam is great for storing breakable valuables like jewelry and you will have peace of mind, knowing that no one can move or break into your safe. The safe features a 16 gauge steel construction that has been tested to be pry resistant. This will allow you to keep the safe anywhere in the house and you will know that no one will have the capabilities of breaking through the walls or door. The hinges have also been designed on the inside of the safe to ensure that the only possible weak point has been covered and that intruders cannot break the hinges with normal hand tools. The safe is a little bit heavier than the average handgun safes and this will add another layer of protection in itself. When mounted the weight will automatically increase and even though it may be heavy, it is still light enough to be fitted on a wall or inside your nightstand. Internally the safe is perfect for storing smaller handguns. The safe features 1 removable shelf and a layer of interior foam. The foam cannot be removed, but the shelf can easily be pulled out to allow more space for bigger items. The interior design is great for allowing you quick access to your firearm and you will avoid struggling to locate the item you need in the dark. The overall compact interior is sturdy and will provide protection to valuable documents and jewelry. The interior foam will also help protect against any impact that the safe may encounter. The safe features an electronic locking system that is easy to open and features up to 12 million different combinations. This will ensure that no one can simply guess your code and will be an added layer of protection against kids and intruders. To ensure that you always have access to the safe, you will also receive a backup override key that can be used if you lose forget the code. If someone tries to force open the safe via the keypad, the safe will automatically go into a timeout after too many incorrect attempts. Furthermore, the safe is powered by a 9-volt battery and will quickly alert you when it is low. The design of the keypad is very efficient and you will have the ability to access the keypad in the dark. It does not feature standard numbers and will offer more simplicity to add to your protection. As a battery powered safe, one might think that is filled with a lot of glitches and problems. But the added audio system will instantly notify you of any tampering and the onboard computer will have the ability to go into a total lockdown mode. The steel will also provide you some protection against fire & heat as it will start to expand once it is faced with more heat. This will give you added value and more functionality when deciding where to mount the safe. Overall the safe is perfect for storing smaller items and firearms, the size flexibility will make it great for mounting in locations that provide you quick access and we definitely recommend the safe as a nightstand gun safe. The Gunvault MicroVault XL MVB1000 Gun Safe is one of the more premium products on the market and may cost a little more than the other safes for all the features that are included. The interior foam will protect your safe in case it may fall and will ensure that none of your valuables are damaged or that a loaded gun may go off. The best feature to be added to this safe is the ability to learn the person’s finger with every scan, thus allowing no one to try and fake your fingerprint and even if you cannot correctly align your finger, the scanner will still be able to detect the owner’s finger. The lightweight frame will also allow you to move the safe easily throughout the house and it can also be disguised or hidden underneath books or papers on a shelf. The extra strength locking mechanism will certainly keep anyone from trying to force it open and the 19-gauge steel frame will be a perfect quality, should you look for something durable that is not easy to pry open. The locking mechanism also comes with two overriding keys to make sure that you can always access the safe even when the fingerprint scanner may fail, this will ensure that you have no struggles and lightning quick access to your firearm in times of need. The safe is also fitted with a temper indicator; this will allow you to see how many incorrect attempts have been made and if someone is trying to enter the safe without authorization. The onboard computer will block too many incorrect attempts at trying to open the safe. This will be a handy feature if you have children that may have stumbled across the safe. The 9-volt battery is automatically added into the hardware and will provide greater longevity than the AA batteries fitted to other safes. The battery will give you with a longer lifetime and will never die on you in times of need. Finally, the manufacturers have included a high strength security cable that will allow you to mount the safe almost anywhere in the house. This will enable you to install the safe high enough that children will not access it and close to you wherever you may be in the house. Overall this safe is perfect for multi-functional use and even though the name says ‘gun,’ this safe can be used to store your entire collection of valuables, from private document all the way to your very expensive and precious jewelry. A great fit for both men and women. Why Choose Gunvault for Your Next Gun Safe? #1 High Grade Steel Construction. All GunVault gun safes are constructed of sixteen-gauge steel, which makes them extra tough and able to stand up to the roughest of treatment. This is especially important in the Mini and Mini-Deluxe models, as they are small enough to store in a closet, or at the office. Because all of GunVault products are made with safety and protection in mind, not to mention sixteen-gauge steel to keep your valuables safe, there is no reason to own any other model of gun safe on the market. GunVault has you covered. They also have soft foam padding on the inside, so if you have additional valuables you’d like to store with your gun, such as family jewelry, watches, or even extra cash, you can be sure they’ll be padded and safe from any harm. 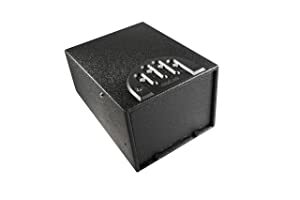 This style of gun safe is designed to slide easily under the seat of a car or truck, but still offers the protection that users of GunVault have come to rely on over the years. GunVault gun safes are build with precise fitting, which means these safes are virtually impossible to crack with traditional lock pick tools. In addition, they have an added security measure which completely locks out the keypad, making it impossible to access after a certain number of attempts without the reset code. GunVault has also taken power loss into account, as the Mini-Deluxe model features an audible sound which will alert you when the power is running low, which could prevent your safe from being secure. In addition, the keypad which is included on all GunVault gun safes has over 12 million programmable key combinations, so setting up your safe with a number only you can access is practically guaranteed. In addition to the many safety features, GunVault also features a wide variety of sizes for your gun storage needs. As previously mentioned, if you’re an avid gun collector, you’ll want to look at the GunVault 5500 and 5900 series gun safes. These models are well equipped to keep your numerous shotguns and rifles safe, while also offering storage for ammo and various handguns that you have in your collection. If you only own a small side arm, the GunVault Mini and Mini-Deluxe models are probably suitable for you. However, if you would like to keep the handgun you keep in your car or truck safe, then GunVault also offers the Micro gun safe model, which includes just enough space for a medium sized handgun and its clip.